Detailed do-it-yourself plans for building your own 12' wide Octagonal Gazebo. This large, elegant gazebo is designed to be customized with a variety of railings and lattice trim. 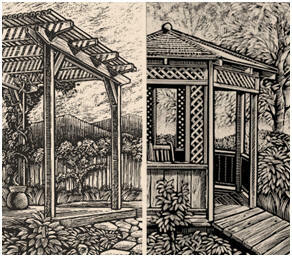 Detailed do-it-yourself plans for building your own 8'x12' Pergola. This sturdy pergola can be easily expanded and can be freestanding or attached to your home or garage. A variety of footing details include a way to build this pergola on your deck. Quality landscape architecture requires building materials that are beautiful and long-lasting. Materials need to withstand environmental elements yet retain their symmetry and aesthetic purpose. Redwood has a well-known reputation for meeting these requirements. Equally important, there are cost-effective redwood grades to specify for every project, whether it is a public plaza or a residential garden. Performance is more than durability. Redwood has qualities not found in other woods-even woods treated with chemicals. Redwood performance characteristics include resistance to shrinking, warping and checking in addition to durability. This means redwood projects age beautifully. Decks, fences and garden structures made with redwood simply look better ten, fifteen and twenty years after construction. Visit the California Redwood Association website for more information and free, expert construction and finishing guides.